A listener recently asked to hear our thoughts on working with engineers and other consultants. So, for Episode 41, Archispeak accepts the challenge and dispenses some wisdom on what it is like to try and herd cats in the world of Architecture. Mark R. LePage of Entrepreneur Architect called out the Archispeak Podcast to take the ALS Ice Bucket Challenge. Each of us recorded ourselves taking the challenge, which you can see on the Archispeak Facebook Page. In addition to the donation that your hosts will be making to the ALS Association we are challenging our listeners to help. Every donation you make to the Archispeak Podcast over the next two weeks will not go to us, but instead will be added together to form one big Archispeak Podcast community donation to the ALS Association. Help us support the cause to create a world without ALS. Thanks to everyone for sending us your guesses as to how many comic books are in Neal’s collection. The correct answer is an amazing 8,526 (see the screen shot.) Since there was not any rules about winning without going over, we are going to announce two winners. The first is Collier Ward for guessing 10,000 and the second winner is Mark R. LePage for guessing 1,500 pounds. Mark made us utilize some long-lost math skills, but 1,500 lbs. calculates out to approximately 6,000 comics. Everyone else wildly underestimated Neal’s commitment to collecting. Number of comics in Neal’s collection. Literally a TON of comics! The show is entirely supported by us and our listeners! Your generous donations keep the show going by paying for all the infrastructure it takes to make this show possible. Become a “Friend of the Show” by donating at least $5 and you will get your name read on the next episode. We truly thank you for your support! We couldn’t do it without you. 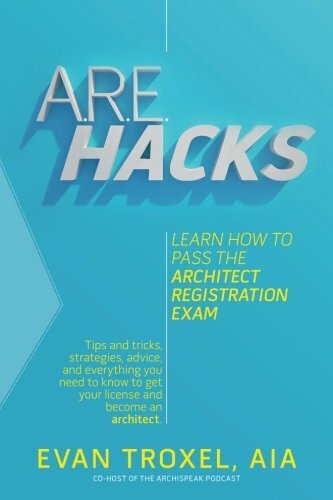 Another way you can support the show and help yourself pass the ARE, is by visiting our “Pass the Architect’s Registration Exam” page. For those of you not yet licensed, here's an affordable set of study tools to help you conquer the ARE's. David's study guides are proven to get you passing the exams. How do we know? Our listeners have told us! How much does the average comic book weigh? Between 4-5 oz.